WIN meal replacement shakes from Vegan Supplement Store! We’ve teamed up with Vegan Supplement Store to give one lucky reader the chance to win ten meal replacement pouches and two protein shakers (worth over £255 all in all)! Meal replacement shakes are a great way to lose weight by controlling calorie intake and providing essential vitamins and minerals, but with the awareness of gluten, dairy and lactose intolerances on the rise, more and more people are turning to plant-based alternatives. That’s why January saw more people than ever signing up to do the ‘30-day vegan challenge’. 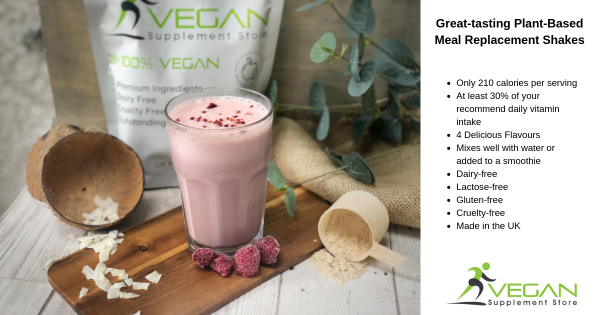 Vegan Supplement Store offers a range of great-tasting meal replacement shakes and protein powders in four delicious flavours including Indulgent Chocolate Salted Caramel, Rich Chocolate, Refreshing Raspberry and Smooth Vanilla, with each delivering around 210 calories per shake and at least 30% of your recommended intake of essential vitamins. To shop the Vegan Supplement Store range, please click here. To enter, simply answer the question and leave your details below before the closing time of Monday 11th February at 3pm.